Enjoy two of the Bay Area’s top attractions on this full-day tour that combines beautiful scenery and fascinating history. Spend the morning in Sonoma Valley, where you’ll visit two wineries for wine tastings. Then head back to San Francisco and board the ferry to Alcatraz Island. Tour the former prison on your own with its award-winning audio tour, and admire the sweeping views of San Francisco Bay. A photo stop at the Golden Gate Bridge is also included. The Sonoma portion of the tour is limited to 13 people, ensuring you enjoy a small-group experience with a knowledgeable guide. Your combo tour begins at Fisherman’s Wharf, where you’ll board the tour bus for the drive to Sonoma Valley. After crossing the Golden Gate Bridge, pull over at a vista point to take pictures of the bridge and enjoy views of San Francisco Bay and the Marin Headlands. Back on the bus, listen to a brief overview about the events of the day from your guide, and then head across the bridge for the 45-minute drive to your first winery, Cline Cellars, which was founded in 1989 by one of Sonoma’s oldest families, the Sebastianis. After admiring the winery's picturesque hilltop location, enjoy a tasting of wines such as chardonnay, cabernet sauvignon and sangiovese. You have about 45 minutes at Cline Cellars before continuing 15 minutes up the road to Larson Family Winery for your second tasting. Not a bit stuffy or pretentious, Larson Family Winery is known for its friendly staff and large outdoor space. Sample varietals like malbec, pinot noir or perhaps a sparkling rosé. After 45 minutes at Larson, make the 1-hour drive back to Fisherman’s Wharf, where your guide leaves you with your Alcatraz tickets. At this point, you’re on your own for the rest of the tour, so grab some lunch at the wharf and do a little sightseeing (own expense). 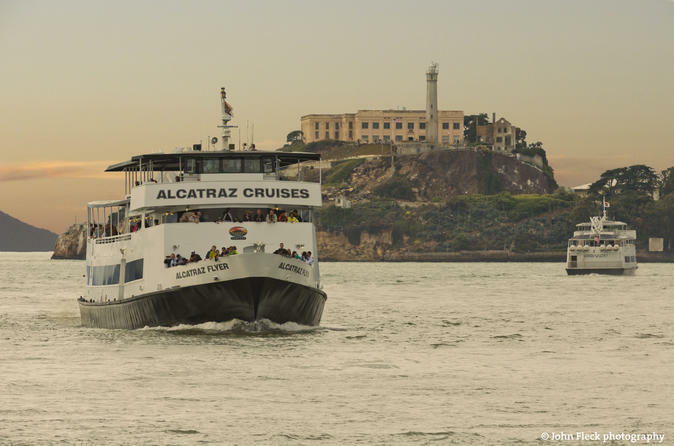 You have about two hours of free time before you need to head to Pier 33 to check in and board the public Alcatraz ferry (either walk about 20 minutes or take a taxi or pedicab). During the ferry ride across San Francisco Bay to the island, admire views of the Golden Gate Bridge and city skyline. The Alcatraz tour is independent and audio-guided; when you arrive, simply pick up your headset and begin your exploration of the historic prison. The award-winning Cellhouse audio tour provides fascinating commentary about life inside the world’s most notorious penitentiary. Walk inside a cell, see where prisoners ate and spent their time, and learn about the legendary criminals who ended up there. You can take the ferry back to Pier 33 when you’re ready; most visitors spend about two hours at Alcatraz. Please note: Winery/vineyard locations are subject to change.